While "X" marks the spot for most, squirrels remember where they've stored their treasure without a map. If you've ever placed something in a specific spot only to forget where you put it later on, you may be skeptical of the squirrel's ability to remember where he's buried his food. Although it was commonly thought that squirrels primarily used smell to uncover their stored food, recent research reveals that memory actually plays a bigger part in their food retrieval. Different types of squirrels practice different food storage methods. Douglas squirrels and North American red squirrels store food in a central location, called a midden, within their territory. This method is called larder-hoarding. Often the midden is located in a tree cavity, under leaves, or in branch forks. Some squirrels store their food for a short period of time, such as the African tree squirrel, which will stick half eaten nuts in branches to come back for a few hours later. The most common way squirrels store their food is by burying it in scattered caches around their territory to dig up later when food is scarce, such as in winter. This way is usually favorable because it makes it harder for other animals or squirrels to pilfer their reserves as it's scattered in many different locations. It was previously assumed that squirrels did not remember where they stored food, but rather uncovered it through scent. 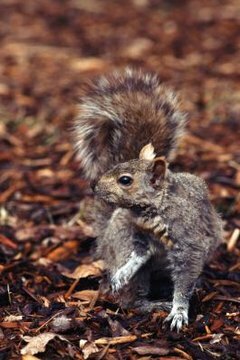 Squirrels do use smell partly to uncover buried caches, and they often find and steal at least a nut or two from other squirrels' caches, which they can detect by the odor. Scent can prove unreliable, however. When the ground is too dry or covered in snow, squirrels are more interested in digging up their own food caches even when they can smell other caches nearby. According to the study "Grey Squirrels Remember the Locations of Buried Nuts," published in Princeton University's journal "Animal Behavior," squirrels use spatial memory often to locate stored food. The study shows squirrels go back more often to their own food caches than to the caches of other squirrels, suggesting that they use memory to locate their food. Squirrels often bury their food near landmarks that aid them in remembering where they stored the food. The study also suggests that squirrels bury food in a series of locations that help them form a cognitive map of all storage locations. Squirrels remember the contents of their caches as well as their location. They remember and return first to the caches that have larger amounts of food stored in them. Scatter-hoarding squirrels will often dig up and rebury food caches to determine whether or not the food stored is still good. Also, it may help the squirrel refresh his memory of what food is stored where.